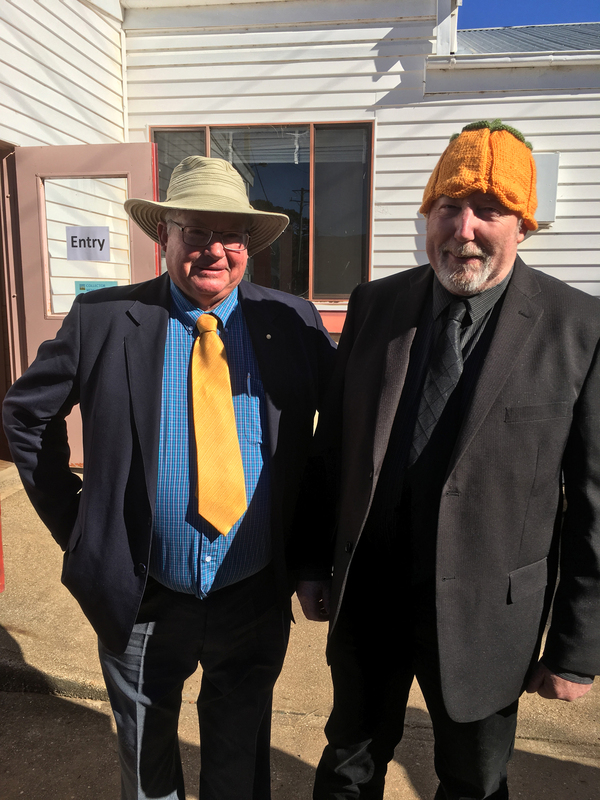 Upper Lachlan Shire Council Mayor Brian McCormack OAM and Cr John Searl at the 2018 Collector Village Pumpkin Festival. Member for Goulburn the Hon. Pru Goward MP today announced that one of the region’s favourite events, the Collector Village Pumpkin Festival, would receive an injection of funds to develop infrastructure as part of the NSW Government’s $200 million Stronger Country Communities Fund Round 1. The Collector Pumpkin Festival, alongside Upper Lachlan Shire Council, are the beneficiaries of $220,000 allocated from the Fund. The grant will enable construction of a shared bike and pedestrian pathway along Bourke and Lorn Streets, connecting the Collector Memorial Hall Precinct and Public and Preschools to the Collector Oval. The project scope also includes the construction of four picnic shelters with bench settings on cement pads in Collector Oval. Ms Goward said the NSW Government’s significant investment in Collector will provide residents with improved facilities for the Pumpkin Festival that the whole region can enjoy. “Stronger Country Communities funding is about investment in local infrastructure to improve the lives of residents and enhance the attractiveness of our region – this funding will help us do exactly that by providing easy access and infrastructure for the Pumpkin Festival,” Ms Goward said. Upper Lachlan Shire Council Mayor Brian McCormack OAM said the funding would enable better pedestrian connectivity and development of Collector’s public spaces. “On behalf of Council and the community I would like to thank the State Government for their investment in our Shire,” Cr McCormack said. There are a total of five projects to be funded under Stronger Country Communities Fund Round 1 within the Upper Lachlan Shire including the Crookwell Showground Upgrade, Kiamma Creek and Clifton Park Walkways and other pedestrian access projects.